Welcome to Day Two of Celebrating Mothers week! If you'd like to join in, you don't have to follow my schedule. You can honor any woman you want at any point this week! 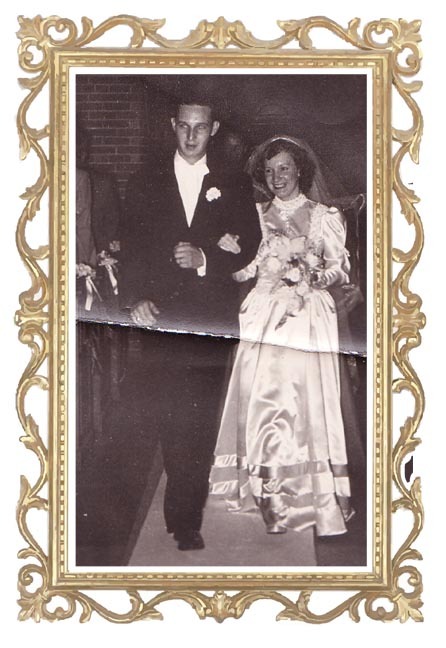 Today, I'm going to celebrate the life of my father's mother, Pauline. To me, she's Grammy. I am blessed to have all four of my grandparents still alive. 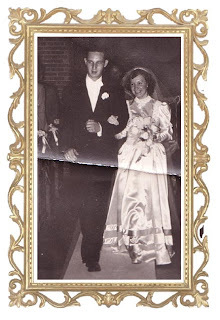 This is a picture of my Grammy and Grampy's wedding day in 1950. That means in September, they will be celebrating their 60th year of marriage! They had four sons (my dad being the second) before they had their daughter (who was a "later in life" baby). My Grammy knew how to handle her four crazy sons (a wooden spoon was often involved). She also got to spoil my aunt after those four sons were grown. Grammy's nine grandchildren range in age from 32 years (and married with 2 kids of his own) down to 4 months! Four of her grandchildren are married and she also has several great-grandchildren. She now gets to cherish her second wave of grandchildren - my aunt's four-year-old, two-year-old, and 4-month-old children along with her various great-grandchildren. 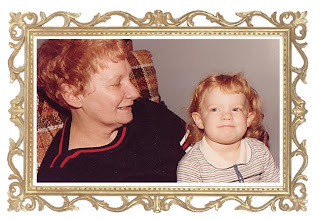 This picture is me at age three or four with Grammy. It's clear to see where my hair color came from! Grammy was an accomplished bowler when she was younger and likes to sit down with her sons and daughters-in-law at holidays to play a hand or two of cards (poker, specifically). Grammy has battled breast cancer and won! As the family matriarch, she keeps everyone in the know about family news. She has a laid-back, positive, encouraging spirit and never misses an opportunity to offer praise for someone's accomplishment. She likes to keep the peace and makes everyone feel at home. Grammy's legacy is her large, fun-loving, pack of children, grandchildren and great-grandchildren! If you'd like to honor a woman in your life, write about her and link to the McLinky below! I plan on posting about my Grandma Gloria tomorrow. I've compiled some pics but now I have to gear myself up emotionally.